We have thousands of thoughts occurring in our head each day--some empowering and others that may not serve us for our highest good. Our thoughts form our belief system. Are we thinking "victim" or "empowering" thoughts? 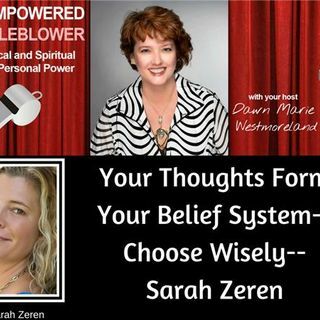 Today's guest, Sarah Zeren shares her wisdom in this interview. Sarah Zeren has been working in the personal development field for 11 years, has a background in mental health + substance abuse treatment and believes in treating the ... See More whole person. Sarah has worked as a clinical therapist at the Queen’s Medical Center’s Outpatient Dual Diagnosis Center in Honolulu, HI and currently runs a coaching + counseling business helping people live more fully using a hybrid approach to personal development. Pulling from her professional experience in core energy coaching, clinical social work + somatic psychology (and her own vastly colorful personal experiences of the good, the bad + the ugly), Sarah works with her clients to blow the doors off of what is holding them back so they can make THIS life it’s absolute best. When Sarah isn’t supporting others ascend into their best life + shed what no longer serves, she is hanging with her amazing daughter, hiking, yoga-ing, cooking, singing, snowboarding, enjoying delicious food and connecting with friends.